Solar eclipses are nowadays major tourist attractions, but in ancient times, they were events of ill omen, to be dreaded and feared. While scientific knowledge has explained the phenomenon, some superstitions continue to hold sway. 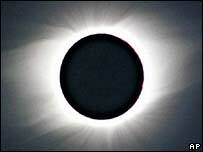 An eclipse in Nigeria in 2001 was seen by Muslim youths as anger from god for sinful activities. And the ancient belief that an eclipse presaged war and devastation is still preached by some mystics in India. A belief persists in India that all cooked food left uneaten during an eclipse should be given away, as it will have become impure. A superstition with rather more common sense behind it holds that anyone holding a knife during an eclipse will cut themselves. Pregnancy has been a particularly fecund source of superstitions. One has it that if a pregnant woman goes out during an eclipse, her baby will be born blind or with a cleft lip. Another says that a pregnant woman should not touch her belly during a lunar eclipse, or she will cause the baby to be born with a birthmark. For most of human history, people did not understand what an eclipse was. It is a terror that goes back thousands of years, with references in the Old Testament and ancient Greek and Mesopotamian literature. The ancient Chinese believed that solar eclipses were caused by a dragon trying to swallow the Sun. To this day, the Chinese for a solar eclipse is "riquanshi", which literally means "sun totally eaten up". If they knew an eclipse was coming, the Chinese would shoot fireworks and bang gongs to scare it away. The Vikings believed two wolves ran after the Sun and the Moon, and that an eclipse happened when they caught up with their prey. They, too, would make as much noise as possible to scare off the beasts. When scientific knowledge was not widespread, a little forewarning could be a powerful tool. In 1503, the explorer Christopher Columbus, stranded in the Caribbean, "predicted" a lunar eclipse he knew would take place to secure respect and fear from the natives - as well as a regular supply of food. Some fared less well. Some time between 2165 BC and 1948 BC, brothers His and Ho were appointed by the Chinese Emperor Yao to keep a watch on the skies. Sadly, they failed to predict an eclipse and the Emperor chopped off their heads. Growing awareness of the science behind the phenomenon did not stop many cultures feeling uneasy. In Japan, wells were covered to prevent poison from dropping into them from the darkened sky. In 17th Century England, John Milton wrote in Paradise Lost: "The Sun in dim eclipse disastrous twilight sheds On half the nations, and with fear of change perplexes monarchs." Today, most concerns centre on the risk of eye damage from looking at the sun directly without protective glasses. Indeed, the level of anticipation ahead of an eclipse is so great that in Ghana, the authorities will sound sirens across the country to announce the eclipse. 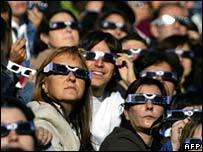 But historically, not all peoples have been so negative in their view of eclipses. Some North American Inuit believe that during an eclipse, the Sun and the Moon temporarily leave their places in the sky and check to see that things are going all right on Earth. And one touching Amazonian myth describes the Sun and the Moon as lovers. They loved each other so much that the Sun's light scorched the Earth and the Moon's tears drowned it. So it was decided that they should live apart in the sky and only be allowed to touch each other's shadow during an eclipse. If you have any good pictures send them to yourpics@bbc.co.uk. You should never look directly into the Sun without proper protective equipment; serious eye damage can result.